In this small but satisfying exhibition of works by a talented emerging artist, a rich range of media has been deployed to describe a set of ideas centering around Ebitenyefa Baralaye’s diasporic identity and life experience. The title Many Rooms is intended to evoke the domestic spaces of home in places Baralaye has lived (Nigeria, the Caribbean and the US), as well as the many realities he has inhabited — emotional, spiritual and psychological. or poetic. Twinned ceramic forms with ridged surfaces, for example, are called Meiping, the Chinese word used to designate a specific type of plum-blossom vase that is similar in shape to Baralaye’s gleaming stoneware pieces (though essentially different, as Chinese meiping have an opening at the top that Baralaye has elided). 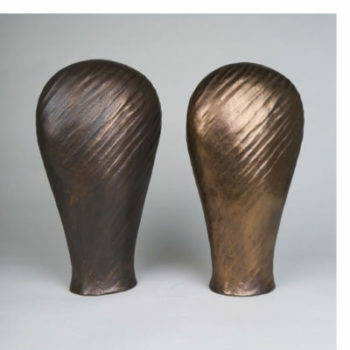 Two other ceramic forms on a nearby pedestal, more square-shouldered but similar in scale and handling, are simply called Nest. 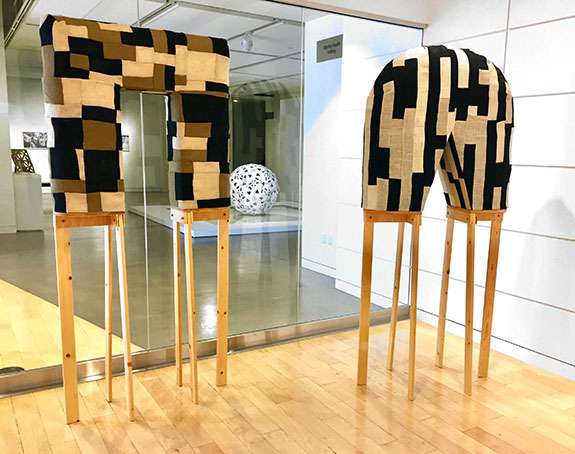 Near the entrance to the gallery, a pair of sculptures, each a patchwork of earth-toned burlap covering a U-shaped form, perch on tall wooden legs. They suggest movable portals or maybe heads, a reading supported by the titles Ori: Afara Tefillah and Ori: Afara Patrida. Ori, Yoruba for head, also means one's spiritual intuition and destiny, and Afara, in the same language, means bridge. Tefillah, the Hebrew word for prayer, reminds us that the term diaspora originally described the worldwide dispersion of the Jews outside of Palestine. Patrida is an ancient Greek word for homeland or birthplace. Baralaye seems to be suggesting that, like the multiple squares sewn together to cover the surface of these pieces, home is a concept incorporating many intricately connected parts. 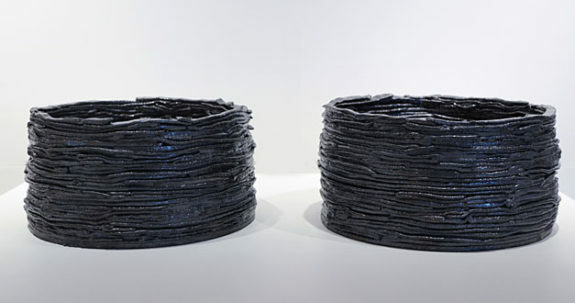 Each of these pieces exudes the artist’s confident handling of materials — wood, clay or fabric. 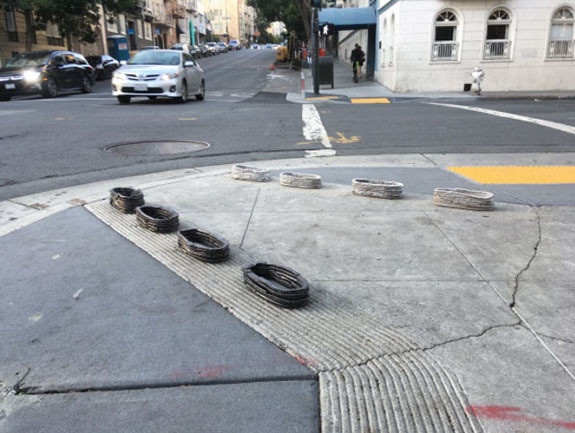 The star of the show, however, is a projected video titled ConTaxts, shot earlier this year on the streets of the Tenderloin, Baralaye’s current neighborhood. It shows, over the course of a few minutes, a family group of eight small stoneware sculptures that have been arranged, deliberately and gracefully, in a succession of unexpected places. 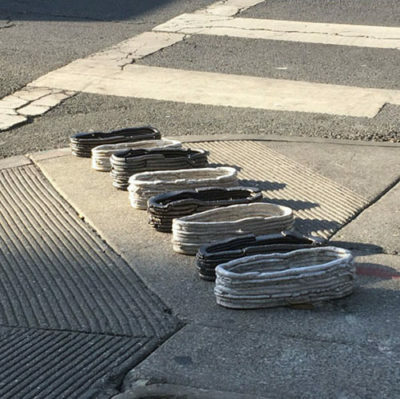 We see them in a line on sidewalks, or placed along the zebra stripes of a crosswalk. In the video, the sculptures appear in various settings: on a piece of cardboard, momentarily “homeless”; holding a parking space, lining a wheelchair curb cut, or resting at a bus stop. We hear cars whooshing by, fragments of conversation, someone yelling. No one really pays much attention to the sculptures. When they are arrayed in a half circle in front of the door of a bodega, a customer steps through them almost absentmindedly. Suggesting some kind of ritual use but defying easy identification, these empty forms turn out to be footprints: three-dimensional versions of the shoe-shaped outlines used on learn-to-dance diagrams, or the marks left behind in sand or dirt. As Baralaye revealed at a recent lecture, these black-and-white forms are a way to map his own interactions with his current location. Unidentified as such in the exhibition, they offer themselves as vessels for the viewer to (metaphorically) fill. Are they witnesses? Alien invaders? Or maybe inhabitants of one of the last transient/poor neighborhoods of San Francisco, trying to find a place to rest? Baralaye is invisible throughout the video, but it isn’t hard to imagine him carefully placing his enigmatic shapes in each location and watching, curious to see what happens next. Maybe there will be another installment of the story, at his next diasporic port of call. One can only hope. Ebitenyefa Baralaye: “Many Rooms” @ MoAD through November 26, 2017. Thank you for this well-written review of a very good exhibit.